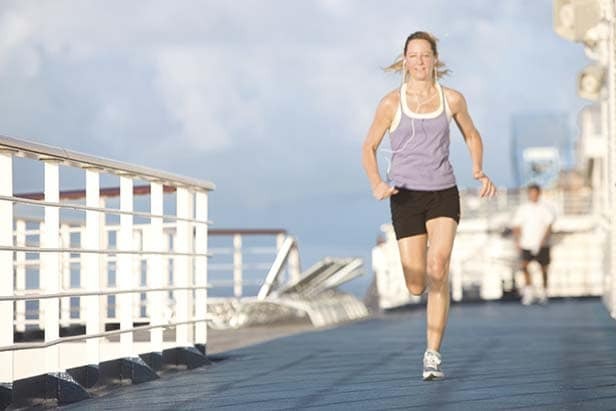 In many ways, staying in shape while you’re on a cruise is easier than doing so in your regular day-to-day life. Every day of your cruise, you’ll wake up with a full day of free time ahead of you, immediate access to an array of onboard activities and amenities that make it fun to keep moving, and so many food and drink choices that you’ll have ample healthy options at every meal. Opportunities to keep active continue when you’re ashore too, with exciting excursions that burn up calories without you even noticing — you’ll be too busy enjoying the beautiful scenery, thrilling adventures and unforgettable family fun. Don’t think of the all-you-can-eat concept as a reason to overindulge in high-calorie foods. Instead, appreciate that, with so much variety available to you at every meal, you’ll always be able to find plenty of healthy options without feeling like you’re missing out. Almost all onboard restaurants offer many menu options appealing to passengers who want to stay in shape during their cruise. 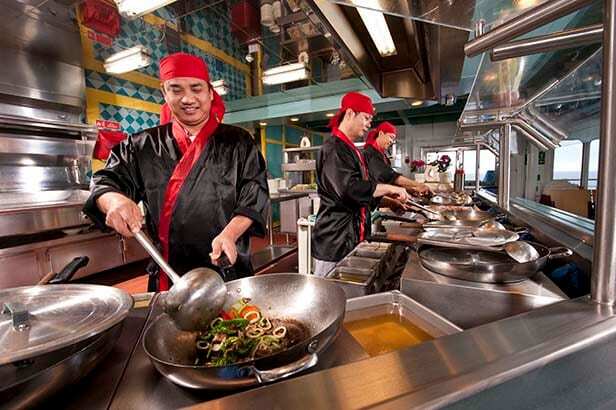 Some of the best include Fresh Creations, a salad version of an all-you-can-eat buffet, the New England-inspired Seafood Shack, which has some lighter seafood items, and the Lido Restaurant, where you can select a custom, veggie-packed stir-fry at the Mongolian Wok station or hit up the salad bar or deli. Fuel a workout with eggs any way you like them at Seaday Brunch, or stave off hunger at any time of the day with 24-hour room service. Hydration is especially important when you’re on a cruise to a sun-drenched destination like the Caribbean or Hawaii, so try to drink mostly thirst-quenching, calorie-free water. 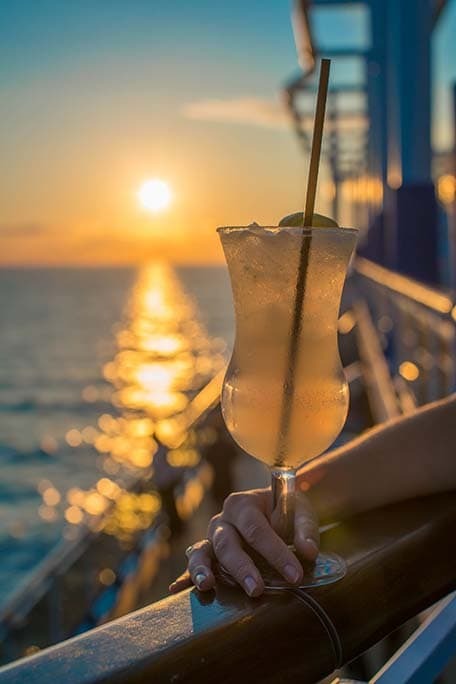 If you want to indulge in alcoholic drinks then certainly do so, but an important element of staying in shape while you cruise is avoiding empty calories, so moderation is key. Perhaps choose to drink wine or cocktails only with and after dinner, or only drink alcoholic drinks every other day. Another way to moderate alcohol calories is to alternate boozy drinks with big glasses of unsweetened tea or water. During sea days you’ll want to take advantage of your cruise ship’s fun onboard activities, especially those that double as exercise. SkyRide is just like riding a bike — except you’re suspended high above the deck (and ocean) as you pedal. Challenge your friends or family members to a race and really make it a workout. A few hours soaring down slides and crashing into pools at a WaterWorks water park might feel like pure fun, but with all the stair-climbing and swimming involved, it certainly counts as exercise too. So does the challenging SkyCourse, with two levels of difficulty to test your elevated obstacle-traversing skill. If you want to stick with traditional workouts or maintain your at-home fitness routine, simply head to your ship’s fully-equipped, indoor fitness center, or work out while cooled by ocean breezes at SkyFitness, which offers punching bags, a Vita course and stationary bikes. Fitness classes, including yoga, boot camp and Pilates, are also available for an additional fee. You can even log some miles on the padded-surface jogging track around the upper deck. If team sports are more your thing, play a game of basketball, volleyball or soccer at SportSquare, which also offers weight-lifting equipment and cardio machines. Other ways to get your workout in while at sea include taking the stairs and dancing the night away at the nightclub or Mega Deck Party. Need to practice your moves before you hit the dance floor? Take a complimentary dance class and burn up to 300 calories per hour. Among the many shore excursions offered at every port of call are numerous active adventures, including swimming, snorkeling, hiking, biking, kayaking, and horseback riding. Remember that long walks on the beach and around shopping destinations both burn a fair number of calories too. Some of these excursions are so thrilling that you won’t feel like you’re exercising at all –until you retire to bed and realize you’re bone-tired. 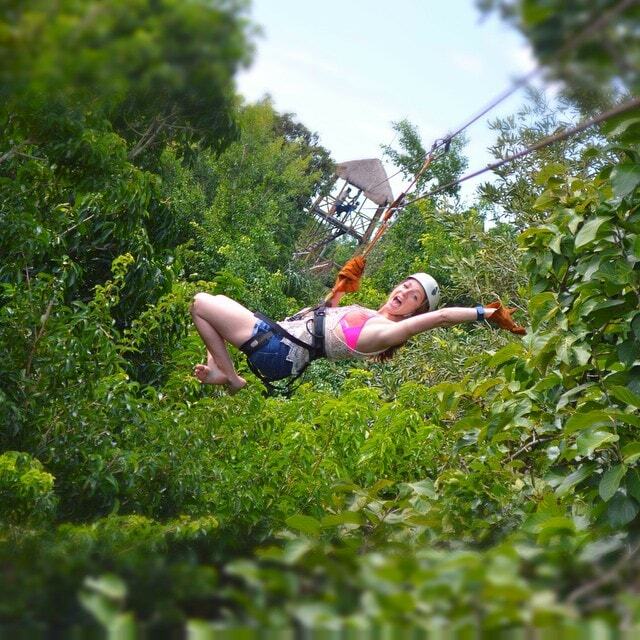 Take, for example, the Canyon Canopy tour in Cabo San Lucas, Mexico. This eco-tour takes you to a UNESCO World Heritage protected reserve deep in the Sierra Mountains, where you will be rappelling down a 90-foot cliff, climbing a “crazy ladder” and soaring along a canopy circuit 200 feet above canyons. 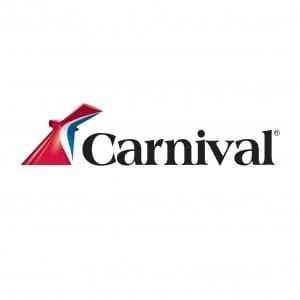 Or consider the Ultimate Land and Sea Adventure on Grand Turk in the Caribbean, an action-packed day of ziplining, horseback riding, driving in a Dune Buggy, sailing and snorkeling. When you travel to spectacular destinations such as the Big Island of Hawaii and The Bahamas, you’re going to want to see the sights, so why not make sightseeing part of your mission to stay fit on a cruise? Select the Kilauea Volcano Biking Adventure from the port of Hilo and see the rain forest, lava fields and a volcanic caldera while biking and hiking. Or the Combo Eco Bike and Hike Tour in Half Moon Cay, a private island in The Bahamas where you will explore by bike and hike up a ridge to take in views of nearby lagoons, cays and islands. 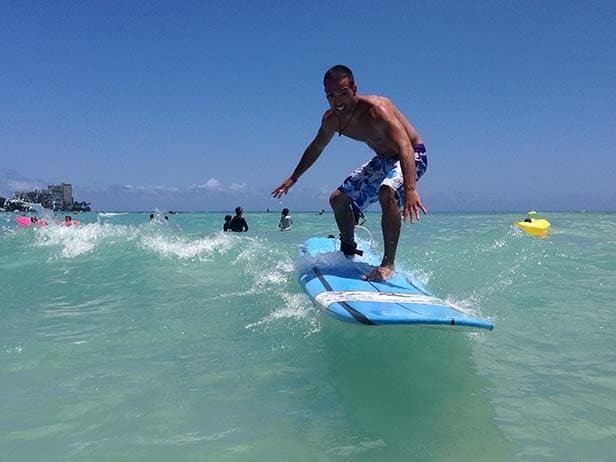 If you’ve never surfed before, embark upon the Surfing Safari in Puerto Vallarta and discover what a serious full-body workout riding the waves can be. 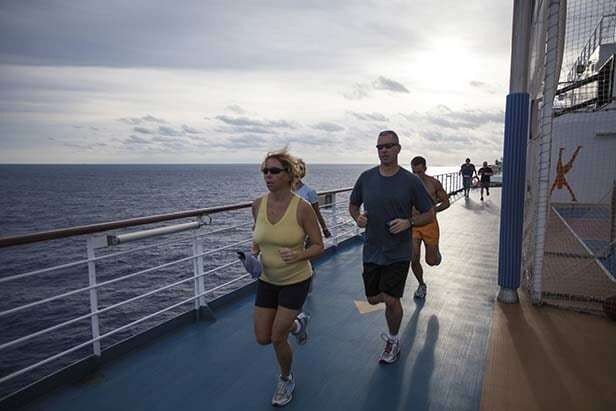 Make it your mission to stay in shape during your cruise, and you’ll return home satisfied that you’ve stayed healthy while enjoying every day with energy to spare. You’ll look at your vacation photos with a smile, knowing you looked and felt your best while filling your days with enjoyable activities and delicious food, all the while creating happy (and healthy) memories. 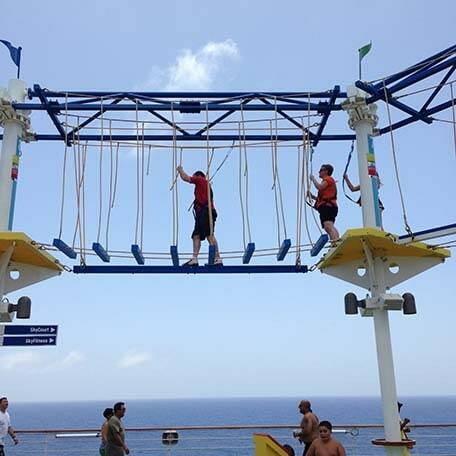 Note: Onboard activities vary by ship.